The pilot of a jet that crashed at the Shoreham Airshow killing 11 men has been found not guilty of manslaughter by gross negligence. Andrew Hill's ex-military jet exploded in a fireball on the A27 in Sussex on 22 August 2015. The former RAF pilot, 54, denied deliberately beginning a loop manoeuvre despite flying too low and too slowly. Karim Khalil QC, defending, argued Mr Hill had been suffering from "cognitive impairment" when the jet crashed. Mr Hill, from Sandon, near Buntingford, Hertfordshire, was also formally acquitted of a count - that was not put in front of the jury - of negligently or recklessly endangering the safety of an aircraft. The Old Bailey jury deliberated for seven hours over three days and there were gasps from the families in the courtroom with many in tears as the verdicts were read out. 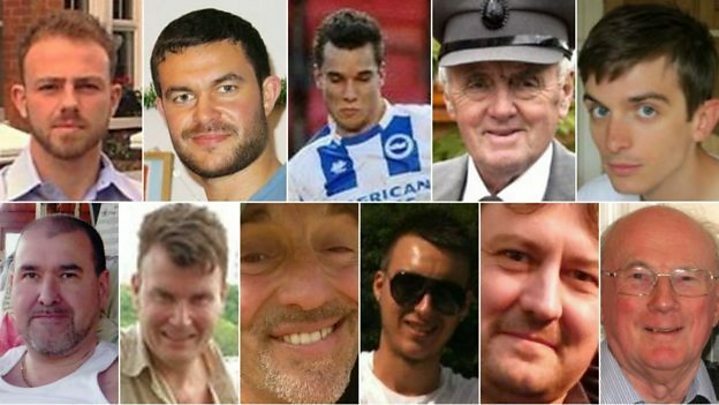 Who were the Shoreham air crash victims? Judge Mr Justice Edis told the relatives: "I am enormously impressed and grateful for the dignified way you have all behaved. "I can see that you are upset and you are absolutely entitled to be but despite being upset you have behaved in a way which does you great credit." In a statement Sue and Phil Grimstone, whose son Matthew died in the crash, said: "There seems to be no justice for our son Matthew and all 11 men who died in such tragic circumstances. The couple said the case had raised questions about the safety of aerobatic air displays "when there is now doubt concerning any pilot's ability to avoid becoming cognitively impaired". They added: "Matthew had no interest in air shows, he could not have cared less. Knowing he died because an aircraft was being flown for fun, for the entertainment of others makes it even harder to bear." Oliver Morriss, nephew of victim Mark Reeves, said his family felt "complete devastation at the most surprising not guilty verdict". He added: "We feel that the success of Mr Hill's defence of cognitive impairment could establish a worrying precedent and have far-reaching consequences." On the steps of the court, Mr Hill read out the names of all 11 victims and said: "A number of people were injured. I'm truly sorry for the part I played in their deaths and it's they I will remember for the rest of my life." The court had heard the Hawker Hunter jet "disintegrated" upon impact, creating a "massive fireball" when it hit the ground. Mr Hill, a British Airways captain at the time, had been performing a manoeuvre known as a bent loop before his jet crashed on to the A27. 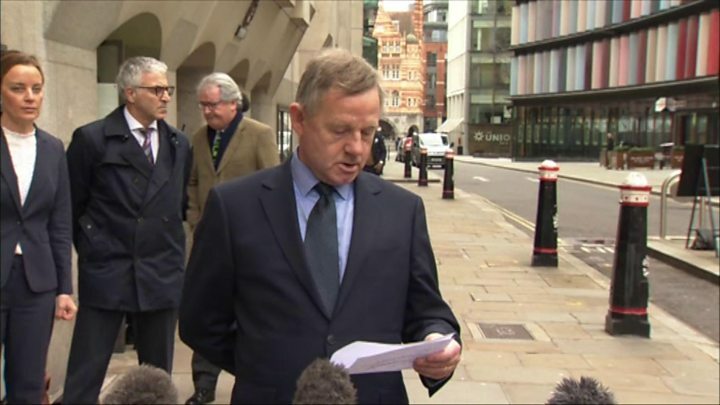 Prosecutor Tom Kark QC, acknowledged Mr Hill was an experienced pilot but said he had been known to take risks and the jet was "probably as much as 1,000ft below the height required" at the top of the loop. The Old Bailey was told that the defendant had a "cavalier attitude to safety". But Mr Hill said he took a "very structured, disciplined approach" to display flying and sometimes held back from flights he was not comfortable with carrying out. The former RAF instructor claimed he had blacked out in the air, having experienced "cognitive impairment" brought on by hypoxia possibly due to the effects of G-force. He "miraculously escaped" when the aircraft broke up and he was thrown into a ditch, the jury heard. He suffered head injuries and fractures to his ribs and spine and was placed in an induced coma before being discharged a month later. Mr Hill told the Old Bailey he had no memory from three days before the crash to when he woke from his coma and had spent the last three years "trying to resolve what happened". In 2017 a report by the Air Accidents Investigation Branch found the disaster was caused by pilot error after the plane was too slow and too low during the loop manoeuvre. Rebecca Smith from Irwin Mitchell lawyers, which represents 17 people affected by the crash, including some bereaved families and of the injured, said: "Attention will now to turn to the inquest where the entirety of the Shoreham Airshow tragedy can be fully examined." Sarah Stewart, a partner at Stewarts, who represent many of the bereaved families, called for a wider investigation. "The bereaved families have had to painfully re-live the circumstances of their loved ones' death again and again. "The families want answers and a verdict will go some way towards that. But it is only one part of the jigsaw." 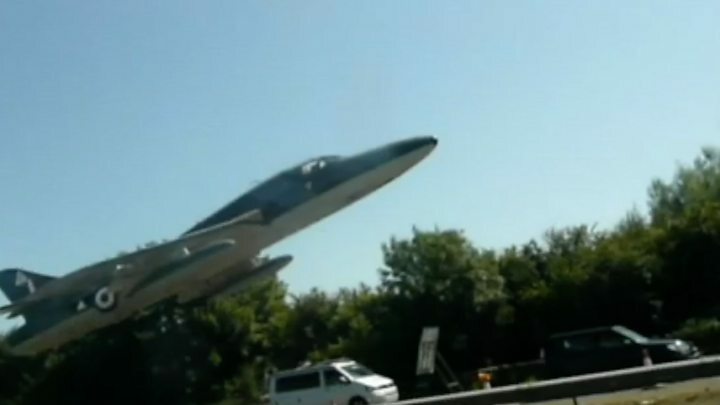 The organisers of the Shoreham Airshow have denied any responsibility for the crash. Colin Baker, director of the event, said: "I feel pretty satisfied that what we did in the preparation for the air show and during the air show was all that could be done. "We very much regret what happened but I really don't think we could have done anything different prior to the accident to avoid it."